This year's Retreat is designed to provide in-depth information about many different sacred sound technologies that have existed throughout many world cultures. A notebook and pen will be provided for you. 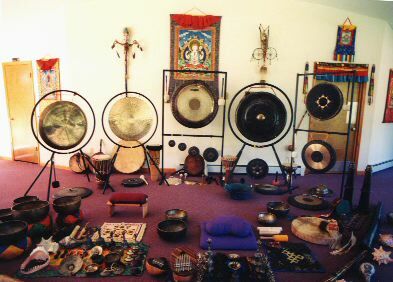 Demonstrations and exercises will be of Vibrational and Sound Therapy, Shamanic Healing, Meditation and applications of various Sacred Sonic Energies. These are group events based upon the compassionate teachings of many cultures and we ask all students to approach this occasion with mutual respect and joyful effort. The Retreat officially starts at 4:30 PM ( sign-in is from 4:30pm to 6pm, the first class is at 6:30pm) on Friday, November 14th, and concludes, late afternoon, on the 16th. There are no cameras or recorders allowed during class, but photos between and after are encouraged. Please be thoughtful of your subject and ask permission of your classmates first as they may not wish to be disturbed. Bring an eye covering and a pad or blanket for the drum journey. If you wish to bring your own instruments, by all means bring them, we love to share instruments and experiences. Shang students please remember to bring your Shangs with you and Phurbas, if you have them. The intent of this retreat is to be hands-on as possible. Days will be filled from early morning to night, with break periods to refresh and recharge in this comfortable and beautiful historic manor home. * Last year's retreat was sold out 2 months before the retreat date. It is recommended to register as early as possible to insure your place.